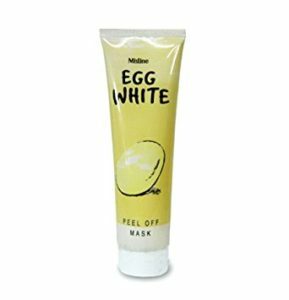 Mistine Egg White Mask helps tighten pores, firmer and smoothen skin as well as reduce acne, acne scars, redness and less breakouts. After applying this mask, your face will be become tighten, amazing whitened, poreless, tighten, good oil balancing, supple and in good texture. Ingredients : Water, Alchol denat., Polyvinyl alcohol, Propylene glycol, Methylparaben, Albumen, PEG-150. Polysorbate 20, Xanthan gum, Mica, Fragrance, Titanium dioxcide, Hydrolyzed collagen, Hydrolyzed elastin, Cittric acid, Sodium benzoate, Propylparaben. Direction : Apply an amount of the peel off mask onto clean face and leave on for 20 minutes and then peel off. Recommend use 1-3 times per week.